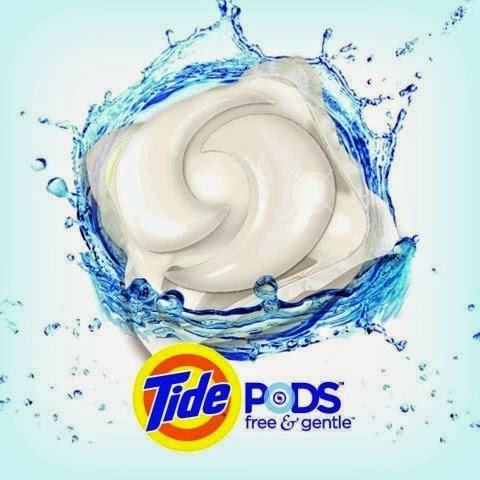 Tide Launches Tide Pods - Free and Gentle for sensitive skin! We all have one thing in common when it comes to getting our family's laundry done - we want detergents that are tough on stains and work the first time. We want detergents that smell good and detergents that leave our clothes and linens so fresh, we think we are in a field of daisies. When you have someone in the family with sensitive skin, you want all of the above plus peace of mind that it won't irritate. Too good to be true? Last year we talked about the benefits of using the Free & Gentle products on our clothes and linens, to avoid irritating those in the family with more sensitive skin. I really like Tide Free & Gentle because it gets clothes clean, smells great and it's gentle. Being a fan of Tide Pods, I was happy to hear about the newest addition to the laundry family, Tide Pods Free & Gentle! With Tide Pods Free & Gentle you don't have to compromise cleaning preformance for gentleness. This detergent offers the best of both worlds in a convienient, premeasured one use pack! - Avoid fragrances or botanicals in your everyday daily washing soaps, detergents and moisturizers as they can be both irritants and allergens. - Stick to non-foaming soaps in the shower. They do not strip the skin of natural oils. - Only shower once a day because water dries out the skin. - Keep bathing times under 15 minutes and avoid using very hot water as it will dry out your skin. - When getting out of the shower, pat dry. Rubbing will remove moisture and dry out your skin quicker. Try new Tide Pods Free and Gentle, the great Tide clean you've grown to love that will leave your clothes looking clean, smelling fresh and not irritating your skin! For more information about Tide Pods Free and Gentle please visit the official website! Show some love and follow Tide on Twitter! In celebration of new Tide Pods Free & Gentle, Tide would like to give one AME reader the chance to win a Sensitive Skin laundry prize pack which includes Tide, Bounce and Downy products in new Free & Gentle ($45 value)! This giveaway is offered across various blogs participating in this campaign. You can enter on as many blogs as you like but you can only win this prize once. Click here for full giveaway terms and conditions on AME. Posted in participation with the P&G Mom program. Perks and incentives are received but opinions and comments on this blog are always honest and my own. I love using Tide Pods! I have only used them when I got a sample. Laundry tip for sensitive skin-use baby soap. I haven't tried these yet but would like to. We buy products that are specifically made for sensitive skin. I haven't tried the Tide pods yet. I don't really have a laundry tip for sensitive skin. I've never thought of the connection between laundry and sensitive skin until right now! No I haven't. Choose unscented products. Yes I have tried Tide pods. I choose unscented products for sensitive skin. We use these products for my children. I swear by Tide pods. My tip would be to make sure you wash all new clothes before you wear them. My best tip is when you find a detergent that doesn't irritate, don't try something new! We've tried Tide Pods that we received as samples! Laundry tip for sensitive skin would be to stay away from strong scents and chemicals. I've tried Tide Pods once. I avoid perfumed scents for our sensitive skin. I have to admit that I love Tide pods. So easy to use and no mess! I haven't tried these yet but would like to. We always use special detergent for the toddler and it'd be nice to have one we could all use. Yes I have used Tide pods before.. I loved them. I have never tried these yet. My best tip is find a detergent that works and stay with it. I love Tide pods...super easy to use and pre-portioned to avoid any waste! we love tide pods! i'm allergic to everything and tide is the only detergent i can use. my suggestion for sensitive skin and laundry is fine what works and stick with it! I haven't tried Tide pods yet.Use uncented products. I have tried tide pods - the original ones and I love how they make the clothes smell. For sensitive I use Ivory right now. Yes I have. They are so quick and easy to use! i have not tried tide pods. nobody in my house has sensitive skin. I love tide pods and i use fragrance free detergent as it helps with sensitive skin! yes,I have tried Tide Pods,,love them! Yes I have tried tide pods. In the past I have used baby detergent for my son with sensitive skin even when he was no longer a baby. I haven't tried tide pods yet. I use a fabric softener to get the fabric as soft as possible. I've tried Tide Pods a few times. They really clean well although I wish they came in a more subtle scent. Maybe they do and I just haven't tried it yet? I have used Tide Pods. No real tip for laundering for sensitive skin other than use detergent and softener meant for sensitive skin and a doing a double rinse. Yes, I have. use a mild soap. I love tide pods! Use laundry detergent for sensitive skin! I love Tide pods! So easy to use and no measuring required. I suggest those with sensitive skin read the labels and buy something that's not scented. I have not tried Tide Pods, my tip is to buy only unscented laundry products. I haven't tried the pods yet, but I find an extra rinse works wonders. If your skin is too sensitive to use any product in your laundry, you can use vinegar instead! I have never used Tide Pods, we have used gain ones and loved them. It made it mess free to do laundry and my son loves throwing them in the machine. 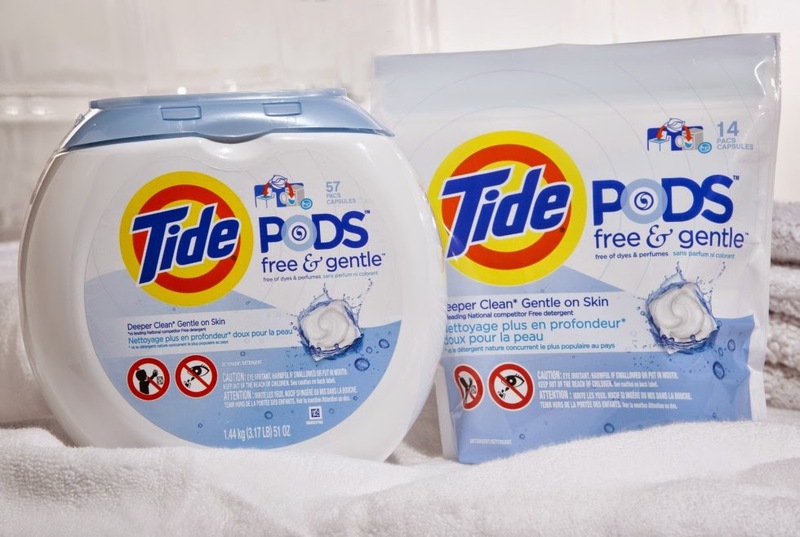 Ive never tried Pods and my best tip is to use detergents which are scent free and biodegradeable. I've never tried Tide Pods before. My laundry hint is to wash delicates inside a zippered pillow case. I have tried the regular pods. My best tip is buy unscented products.